Ever the Optimist is an exhibition of works that draw on my experiences and surroundings. I combine aerial landscapes and domestic objects through sculpture, photography, and installation to illustrate our connections with everything and everyone around us, as well as what they have to teach us. Although positivity has always been a part of my identity, personal life changes and international events in the past few years have made it difficult for me to maintain my optimism. Only through making artwork and objects have I found any refuge – a way of life that can allow me to exist as both a realist and an optimist. 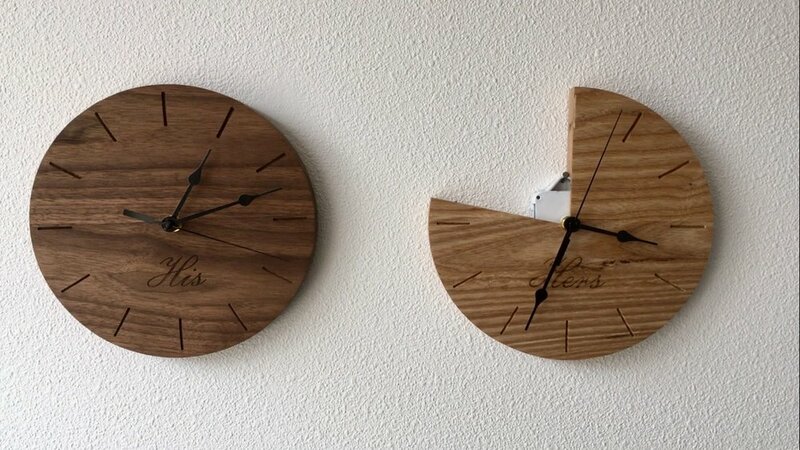 Walnut, Ash and Clock Components. Lies I've Been Told: "You should be happy." I was once told I should be happy when a good decision is made for me. Sure, one can probably come up with a few scenarios where we can let this statement go, however in the context of the original conversation from which this statement is drawn, I cannot. Blankets to me, have always been a source of comfort. Artists spend their career trying to get out of their comfort zone, I am attempting to do slightly the opposite. To find comfort in reclaiming these words, to bring them into a space where I can feel the power of using them in a work and combining them with an object of comfort. This series of prints are a meditation on the state of our world, where I can get lost in color blocks, focus on images of houses and forms in aerial landscapes.